In New Jersey, property owners and business owners alike are charged with maintaining their property in a safe condition. 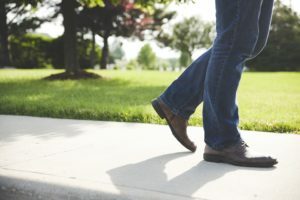 If they breach that duty and you slip and fall, or trip and fall, it’s very likely that you will be able to bring a claim for your injuries and your damages. It’s very important after a fall down to make sure you look around and see what it was that you fell on, and, if possible, take photographs, and as soon as you can, report that incident to the store, or property owner, or police. After you slip and fall, you will have to determine who owns the property on which you fell. For example, if you slip and fall in a retail store, you will have to notify the managers of the store so they can be aware of the conditions that caused your injury and make sure no one else gets injured. It is also necessary to do this because if you are injured in a store and you don’t tell anybody but you try to come after the store in a lawsuit, they will say that they were unaware of your injury. On the other hand, if you slip and fall on a property such as a sidewalk that may be government owned as a result of ice that was not salted, you may only have a claim if there was prior written notice about the conditions. If you are injured due to icy conditions, there may only be a case if the ice was not properly taken care of by the municipality after a reasonable amount of time has passed. Prior written notice does not apply if you are injured on the property of a private landowner.